Electron, Boy Band Review featuring The Hot Sauce Committee, TNT-Chicago - The AC/DC Tribute and Hard Rock Cafe Chicago’s Live Interactive Dinner Show Rock Baby Rock! Hard Rock Cafe Chicago (63 West Ontario) announces an exciting line up of upcoming live music events through the end of May including Electron, Boy Band Review featuring The Hot Sauce Committee, TNT-Chicago - The AC/DC Tribute and Hard Rock Cafe Chicago’s live interactive dinner show Rock Baby Rock. On Saturday, April 16 at 11 p.m., guests are invited to watch Electron, the Philadelphia based super-group featuring Marc Brownstein and Aron Magner of The Disco Biscuits, Tom Hamilton from Tom Hamilton's American Babies, and Mike Greenfield of Lotus. Tickets are $25 for General Admission; $35 for VIP balcony, which includes access to the second floor balcony, second floor side stage views and private bar; and $180 for a VIP private reserved table for four, which includes a private server, four VIP tickets with access to second floor balcony, and bottle service for an extra charge. Guests must be 21 years or older to attend. For more information or to purchase tickets visit www.Universe.com/Electron. On Saturday, April 23 at 10 p.m., The Hot Sauce Committee, Chicago’s original 90’s Boy Band tribute, will be transporting the audience members back in time to the days of frosted tips and hunky front men professing their undying love. The Boy Band Review is an incredible throwback experience with dancers and back up singers where the audience members relive the best years paying tribute to *NSYNC, Backstreet Boys, New Kids On The Block, 98 Degrees, O-Town, Boys II Men, Bell Biv DeVoe, Jonas Brothers, One Direction, LFO and more! General Admission tickets are available for advanced purchase for $7, or for $10 at the door. All ages are welcome. For more information or to purchase tickets visit www.Universe.com/hotsaucecommitteehrc. On Saturday, May 7 at 10:30 p.m., TNT-Chicago- The AC/DC Tribute will recreate the classic AC/DC concert experience in a two hour long show that will grab your attention from the beginning and never let go, playing all of AC/DC's hit song. The band is led by front man Jim Irwin, who sounds strikingly similar to both of AC/DC’s distinctive lead singers, Bon Scott and Brian Johnson. Plus, TNT-Chicago plays every song note-for-note, achieving the same sound as AC/DC by professional musicianship along with the use of guitars, amplifiers and drums that are virtually identical to those used by AC/DC. General Admission tickets are available for advanced purchase for $7, or for $10 at the door. All ages are welcome. For more information or to purchase tickets visit www.Universe.com/TNT. Rock Baby Rock- A Live Interactive Dinner Show! Goodness gracious! Due to overwhelming response, Hard Rock Cafe Chicago and Foxhole Chicago have added performances of their live, interactive dinner show Rock Baby Rock on select Tuesdays through May including April 5, 19, 26 and May 3, 10, 17, 24, 31 at 7:30 p.m. Rock Baby Rock is a family-friendly and fun-for-all-ages show starring Lance Lipinsky, an original cast member in the hit Chicago musical Million Dollar Quartet where he played the role of Jerry Lee Lewis, and his band the Lovers. Guests of Rock Baby Rock can dance and sing along as the show celebrates the birth and history of the Rock & Roll era of the late 1940s to mid 1960s, featuring major hits from some of the biggest artists of the era including “Great Balls of Fire,” by Jerry Lee Lewis, “Shake Rattle & Roll,” by Bill Haley & the Comets, “Don’t’ Be Cruel” by Elvis Presley, “The Twist” by Chubby Checker and Buddy Holly’s “Peggy Sue”. Advance Purchase tickets are $45 and include a $20 food and beverage voucher*. Doors open at 7 p.m. Tickets are available for advanced purchase at www.RockBabyRockLive.com. All ages are welcome. *Food and beverage vouchers must be redeemed on the same night of the show and are only valid at Hard Rock Cafe Chicago. With venues in 68 countries, including 163 cafes, 23 hotels and 11 casinos, Hard Rock International (HRI) is one of the most globally recognized companies. Beginning with an Eric Clapton guitar, Hard Rock owns the world's greatest collection of music memorabilia, which is displayed at its locations around the globe. Hard Rock is also known for its collectible fashion and music-related merchandise, Hard Rock Live performance venues and an award-winning website. HRI owns the global trademark for all Hard Rock brands. The company owns, operates and franchises Cafes in iconic cities including London, New York, San Francisco, Sydney and Dubai. HRI also owns, licenses and/or manages hotel/casino properties worldwide. Destinations include the company’s two most successful Hotel and Casino properties in Tampa and Hollywood, Fl., both owned and operated by HRI parent company The Seminole Tribe of Florida, as well as other exciting locations including Bali, Chicago, Cancun, Ibiza, Las Vegas, Macau and San Diego. 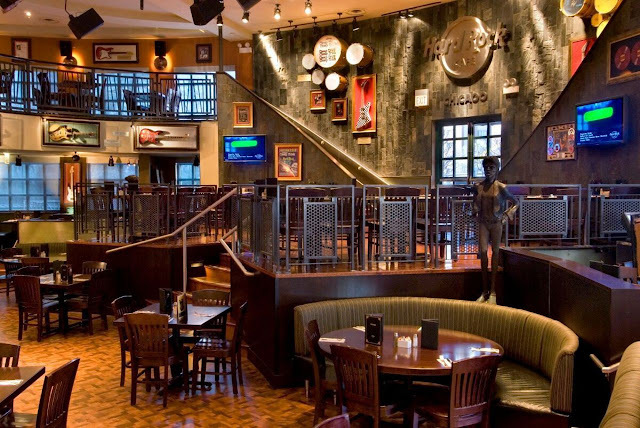 Upcoming new Hard Rock Cafe locations include San Juan, Reykjavik and Gran Canaria, Spain. New Hard Rock Hotel projects include Atlanta, Berlin, Daytona Beach, Dubai, Los Cabos, Tenerife, Abu Dhabi, and Shenzhen and Haikou in China. For more information on Hard Rock International, visit www.hardrock.com.